Russian International Affairs Council talked to Ariel Cohen, a Senior Research Fellow for Russian and Eurasian Studies at The Heritage Foundation about the future of U.S.-Russia relations. Cohen predicted the Russian financial collapse nine months before the event actually took place in 1998. Cohen is also often called upon to testify on Russian politics before the U.S. Congress. Today Ariel is examining U.S.-Russia relations. Russian International Affairs Council: Ariel, what shortcomings do you see in the public diplomacy between both countries? 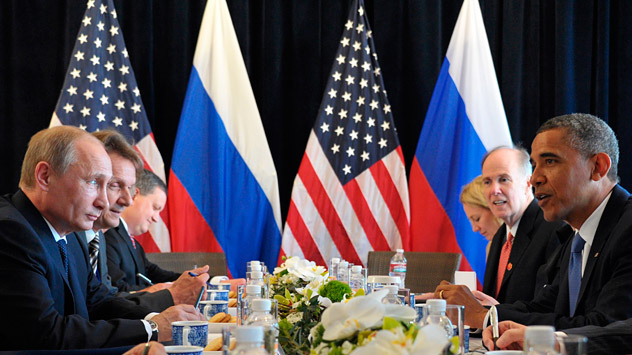 How should public diplomacy be channeled to improve strained U.S.-Russia relations? Ariel Cohen: First of all, after the end of the Cold war, public opinion research demonstrates that in both countries the perception of the other side as an enemy decreased; in the United States it remains pretty stable, and the majority of Americans do not perceive Russia as a Cold-war-style adversary. Americans are now convinced that China is catching up or already overtook the United States as the next – in the business we call it - “peer-competitor”, not Russia. Islamist terrorism is also perceived as a transnational threat, not Russia. In Russia, on the other hand, the perception of the United States as an adversary fluctuates, it depends on the situation. For example, Kosovo (1999), Iraq (2003) and Georgia (2008) led to peaks of anti-American sentiment in Russia. But what worries me is the consistently anti-American tenor of propaganda on state-owned channels, especially on television, with a lot of old Soviet films or new programming - sometimes even from corners I don’t expect, such as Alexander Gordon’s discussion of the U.S. roots of the 9/11 attack. I was invited to participate - I declined. There are programs with Michael Leontiev, Maxim Shevchenko and others that clearly are carrying water for a particular party line. I think, with Russia playing a positive role supporting the U.S. mission in Afghanistan in terms of transit and even discussing a transit base for NATO in Ulyanovsk, it is high time to put away this very nasty language and these images of the adversary, when we face common challenges from a rising China. In fact, I do believe that a rising China is a bigger challenge to Russia, because of the long border between Russia and China in Siberia and the Far East, because of the uneven levels of population. China has 300 million plus people in its Heilongjiong Province— Russia has something between 7 and 8 million people, east of Lake Baikal. So, this is a serious long term challenge for Russia and for everybody else. I am not saying it is a military challenge, but it is a security challenge, it is an economic challenge. Take that issue with the issue of terrorism fueled by religious radicalism (so far as to mention Dubrovka, Beslan and other tragic attacks on the civilian population in Russia) and compare them to the attacks of 9/11 and U.S. involvement in Afghanistan and elsewhere. I do not see the language of this relationship as optimal at all. There is too much emotion and too little practical discussion of important issues between the two countries. RIAC: Has Putin’s rhetoric towards the United States changed now, compared to his two previous terms as president? A.C.: I think that Putin’s first term was the most cooperative. Let’s remember that this is when the Russian president offered assistance to the U.S. and, at that time, anti-Americanism was not a dominating factor. But, as early as 2007, I was at meetings where he blamed the United States for Georgia and the global economic crisis. These are not secrets, these are all public statements. I think Vladimir Vladimirovich is being quite harsh in assigning guilt and blame here. While the United States tends not to respond to such accusations, I’m sure that they are not necessarily helpful. Today there is a continued blaming of the U.S. and U.S. currency. I have not noticed that these statements decreased the amount of U.S. dollars in circulation in Russia or the currency mix for those Russians who are fortunate enough to have significant foreign currency deposits. RIAC: How can we build trust between the two countries? A.C.: One thing that I believe we can do is have reciprocity. If the United States opens its media environment to RT (Russia Today) – and I have it in my house, right next to Al Jazeera and BBC TV and Deutsche Welle ‒ and we now have radio Voice of Russia broadcasting in English in the United States, then I think an equal amount of time can be given to the Russian public for U.S.-funded stations, like The Voice of America and Radio Liberty. Unfortunately, the United States doesn’t even have a product; it doesn’t have a global TV channel that is funded or sponsored by the U.S. government, the way that RT is sponsored by the Russian government or CCTV is sponsored by the government of China, or Al Jazeera – I hate to say it – is an excellent English-language news channel sponsored by the Emir of Qatar. So, in that respect, there is some lack of equality. But beyond that, if you compare the number of people who receive their education in the U.S., there are tens of thousands over the years, and hundreds of thousands of these millions are Chinese, yet very few are Russian. The United States is attractive and it offers excellent education, though it is expensive. But other governments in Eurasia – Kazakhstan with Bolashak Program, Azerbaijan and others - pay their students to go all over the world to study. And I don’t see why the Russian government should not invite Americans to come and study in Russia and fund Russian young men and women to come to the United States to study. Of course, this kind of experience, this kind of education is not a panacea, and it is not something that will for sure make people Goodwill Ambassadors. We actually know this from history: Paul Pott studied in France, but that didn’t make him a great democrat, did it? John Lloyd was, I think, educated in France; although I am not sure, maybe he was British-educated. Anyway, some of these people who received education abroad did not necessarily embrace Western values. Another good example is a guy named Muhammad Qutb. He hated America when he was on an exchange as a young official and, in the late ‘40s, he said: “American women are immoral, American culture is bad”. And this was the time of a very conservative America, as opposed to what happened in ‘60s. So, there is no panacea, but I do believe that people who meet and experience each other’s cultures put to rest some of the stereotypes. I am active on Facebook even in Russia, and you always hear about how Americans are fat, stupid, etc. But then you point out that American men live 20 years longer than Russian men, that an average American citizen has a GDP per capita 4 times higher than his Russian counterpart, and that the U.S. is still a home for innovations everywhere from iPhones and mp3 files to breakthrough drugs that save lives. This somehow doesn’t count towards American intelligence or American health. So, again, I am trying to say that visiting each other (what used to be called during Gorbachev years “people to people exchanges”) may play a positive role; although, clearly, this idealized image of the United States that I remember from my childhood is gone and is not going to return. But still I think that America is a great country, and there are a lot of things people can learn, enjoy and appreciate if they come to America and vice versa – if Americans go to visit Russia. Just the other day, in the Washington Post, I read a horrible account about obtaining a Russian visa. In the 21st century, I believe that things like that should really be resolved. RIAC: Are there any other areas in which Russia and the U.S. can cooperate? How is Russia's accession to the WTO going to change trade relations between the two countries? A.C.: Well, hopefully it will, because we have a very weak economic relationship in terms of sheer numbers. The trade between the U.S. and Russia is $40 billion a year, which is less than our trade with Belgium or the Netherlands and smaller than our trade with South Africa. While Russia exports twice as much to the United States than the United States sells to Russia, the balance is interesting too, because Russia is primarily selling raw materials and buying machinery, hi-tech, entertainment products, films, software, etc.— so there is huge opportunity here. But, at the same time, American businesses are accustomed to investing in secure environments where they know that people won’t knock on the door and try to seize assets. This sometimes happens to American or Russian companies in the phenomenon known as the raiding, which is a specific way of doing business with corrupt courts and judges and corrupt law enforcement. This is, of course, what is bothering American business people and American lawmakers. The latest example is the Magnitsky legislation, which I’m sure you are going to ask me about. The Magnitsky legislation - I just came back from the Capitol Hill where I was talking about it - is not about Sergey Magnitsky and it is not even about Russia; it is about people who violate human rights and, at the same time, benefit personally from these violations, in terms of money. That is why the Magnitsky legislation suggests that ill-gained assets acquired by gross human right violators be subject to seizure around the world. This is not just the United States: other countries like Canada and a number of European countries are moving in that direction. But the Magnitsky legislation is also about how business is done, because Sergey Magnitsky was working for a Western investment fund that clashed with some corrupt officials, whom two Russian presidents (Putin and Medvedev) called “werewolves in epaulettes.” This is where American and Western businesses feel extremely uncomfortable and face risks of losing money. Of course, this is something that the legislation is trying to address, in an environment in which both Russian lawmakers and Russian law enforcement failed to address it. RIAC: Well, Russian officials obviously don’t see the Magnitsky bill the same way. How is the U.S. actually going to strike a balance between defending human rights in Russia and continuing the “reset” policy towards Russia, which is so cherished by the Obama administration? A.C.: First of all, let’s start with a piece of legislation that people of an older generation remember, though a lot of younger people never heard about it: the Jackson-Vanik amendment. The Jackson-Vanik amendment was passed in 1974 by Senator Jackson and Representative Vanik, in order to address problems with emigration from the Soviet Union. Well, the Soviet Union is no longer with us and emigration is open; the problem for people who want to emigrate now is getting an entry visa, or, if they want to emigrate forever, finding a home elsewhere. That is a different problem. Therefore, the time has come to end the Jackson-Vanik amendment and raise the barierr against trade with Russia. Year-after-year, American presidents have lifted the Jackson-Vanik restriction, so that real business with Russia didn’t suffer very much. But now we are addressing prestige issues that come with granting Russia permanent normal trade relations (PNTR) status. At the same time, I view the Magnitsky legislation as a positive development, and I say only in half-jest that the Russian government should give Senator Cardin (Dem.) and Senator McCain (Rep.) a medal for attracting attention to the real issue of corruption in law enforcement, tax authorities, etc. Everybody agrees that there is a big problem there. I have heard presentations and speeches by President Putin in his first term, his second terms, by former President Medvedev, and now by President Putin again stressing that corruption is a big, big issue. So, this is one of the ways to address it, as well as the whole issue of abuse of state power and law enforcement power. It is and issue of great concern to lawmakers, and once you have Russian businesses behaving like Western European businesses, or Australian, or Canadian businesses, or American businesses, I think we will be able to talk about lifting the Magnitsky legislation. In the meantime, people who had abused Magnitsky were promoted and given awards after the Presidential Human Rights Commission published reports about the Magnitsky case. The Russian Presidential Human Rights Commission suspected that Magnitsky had been tortured, and in any other country there would have been an impartial investigation. Nothing like that happened. These people were promoted, and awarded medals. So, I think this is the real issue and I think it is actually better not to sweep these issues under the rug. First published in Russian in Russian International Affairs Council's website.